What is Measurable Quality? The idea of taking something that is seemingly qualitative and turning it into something quantitative for measurement over time is the cornerstone of establishing key performance indicators - management via metrics. You are probably already familiar with The Vital Few versus The Trivial Many (aka Pareto's Principle or "The 80-20 Rule"). This is a long-standing concept applied to management of business processes, financial investments, sales and marketing productivity, customer satisfaction, and the list goes on. In the business context, metrics are applied at each level of management down to individual account management itself. If managers focus on their vital few key performance metrics, the rest of the equation naturally falls into place. Each level of management, from the executive to the front-line reps has their own vital few. At the C-level, we're talking about market share, revenue, and operational expenditures. For middle management key metrics include revenue generated per employee, departmental or team expenses, and productivity metrics like time on the phone, number of leads generated, or number of appointments scheduled. The trickle down means that immediate supervisors and their reps are tasked with managing the real details. All of this makes sense, and intuitively, this organizes the tasks appropriately and leads to success. The problem with this approach is that it completely ignores the human factor. When you are rapidly signing up new customers, generating tons of qualified leads, engaging all of your hot prospects, and closing new business, are your customers guaranteed to be happy and singing your praises? Which of these metrics helps you understand how well your product or service is achieving your customers' objectives? If the increased revenue is making your employees more money, do you just assume that their income growth is keeping them happy and energized? In manufacturing we went from W. Edward Deming's Total Quality Management movement and then added a focus on standards as the key to quality. Quality through standards has continued to evolve internationally through the generations of ISO compliance, and the science moved to the world of Six Sigma Quality management. Six Sigma has traditionally been applied to manufacturing, but in the hands of John H. Flemming and Jim Asplund, Six Sigma was applied as a management tool for customer interactions called Human Sigma. Human Sigma is about understanding the work environment and individual employees. Human Sigma brings the human factor into the set of KPIs, and the approach establishes a foundation for determining steps to create consistently excellent employee customer interactions. Finally we can begin to take the previously unmeasurable human factor into account and track it over time. I wonder if this will generate more thank you pizzas? Performance Metrics - In the corporate world there is tremendous effort applied by management surrounding metrics, and this philosophy has trickled down to small business rapidly with affordable yet robust systems focused on metrics like CRM, IP phones, web analytics, search engine optimization, help desk ticketing and good old accounting. Why with all of this experience, infrastructure, and applied science is customer service generally terrible? Key performance indicators in call centers surround call resolution time, call volume, number of open issues, and escalation data. Statistical analysis is done by another group of managers who are tasked with minimizing expenses and maximizing volume. Even the smallest businesses are moving to outsourced call centers or building in-house teams based on these principals, and suddenly their unique competitive advantages - quality customer relationships, understanding goals and objectives, and domain expertise - are lost to real-time measurements that theoretically translate to higher levels of success. What is missing from these equations? If running successful call centers is such a science, why can't my small regional credit union implement my change of address after one request? What are the vital few in customer satisfaction? It all boils down to the human factor. Empathy, patience, and the true desire to help people are the foundation. Building skills surrounding these key factors to provide excellent service can be accomplished through training, experience and quality infrastructure. The vital few of customer service are things like repeat business, size of initial purchase compared to subsequent purchases, and feedback feedback feedback! Believe it or not feedback about how our software would be better if it did X, Y, or Z is a huge indication of customer satisfaction. This means that the customer is really using the program, and they believe in the company behind the software enough to warrant taking time to share details about their experience. When was the last time you sent the tech support person you spoke with a pizza for lunch? True story - we've received pizzas, unannounced visits, and even customers' plans to publish as thank you. It does not get more measurable than than a thank you pizza from a customer! That's in my vital few - I check on the number thank you pizzas we have received everyday around noon. So, this group of British agriculturalists were visiting the corn growing areas of Iowa. During their discussions with the farmers and touring a cannery they asked how much corn was packed. "Well, we eat what we can, and what we can't, we can." This clever witticism elicited a good deal of laughter. On their return to England one of them retold the story. "...They eat what they can, and what is surplus, they put up into tins!" You have to know your audience, and how to talk to them. If you are approaching a bank, or venture capitalists, or a group of investors, or your partners, you need to tailor your business plan presentation to your audience. Build your company's business plan in Business Plan Pro. Then, as you prepare for each new meeting, save a copy of your plan, and use that copy to refine your text to use words, phrases, and language that your intended audience will understand. 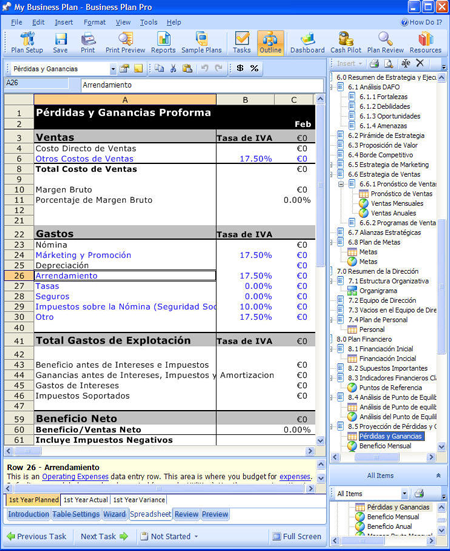 Then, generate your customized presentation with Business Plan Pro's Reports feature and PowerPoint export tool. When your business is on the line, you have to tailor your plan, and not depend on a canned presentation. Good Service or a Dirty Word? I was in a ski shop a couple of weeks ago, and for the first time ever I saw a pair of these hand-made, short run, seriously nontraditional skis that I have been researching for the better part of three years. These skis are definitely made for "skiing the extreme." The best part about the shop is that it is staffed by real riders who know how cheesy it is to say anything about "skiing the extreme." I have always envisioned these skis in my quiver paired with a particular set of alpine touring bindings that are the standard throughout the world for quality and reliability. I ran the idea by the guy who I was chatting with in the shop, and he grimaced. It turns out that the shop has been providing ongoing service for someone who made the same choice at the beginning of the season only to have ripped out the bindings several times because of major torsional pressure. I bought the skis, I changed my vision and paired them with the right bindings, and they are being hand-drilled and mounted as I write this. I am looking forward to being waist deep in fresh Cascade Cement in the next few days without my bindings ripping out of these beautiful pieces of mountain art. Why has "sales" become such a dirty word? Why is the idea of selling synonymous with psychological manipulation? Are there really so many hacks out there selling? Yes there are. Imagine if this shop had hired a bunch of people with roots in sales but no experience with real skiers? They could have asked me,"What is it going to take to get you, someone who skis the extreme, into these skis today?" and I would have laughed and walked. All of the rest of the steps in completing the transaction align naturally, because you both share the same goals from that point forward. Did he sell to me? Yes and no. What they did really well in this shop is what any good sales person does in any industry; they shared their expertise with a prospective customer and provided the know-how for the customer to make an informed decision. They saw that I was a hot lead, and they asked the right questions. By listening closely they differentiated themselves as the number one resource for properly setting up these crazy skis. A quick true story to paint the picture. Our online fraud investigation team and controller both recently tried to make contact with a specific fraud investigator at a major international bank. We received a message from this individual investigator there about a flagged transaction that occurred on one of their customer's credit cards. After several calls to the same number at different times of the day connected with various people in various countries, we connected with a very honest customer service rep. This person told us to keep calling and calling, and at some point, we would get lucky and actually connect to the team that is in-house; true internal employees who could route us to this investigator. Seriously? Is it really that out of control? I mean we have the guy's name and telephone number from the message that he left us to call him back! We need to spin the wheel, throw the dart, wait for the stars to align to reach this guy who called us in the first place? I can understand why customer service and support conversations have increased in difficulty over the past ten years for both customers and company representatives alike. Service providers have all but trained customers to turn the rudeness dial way up with call center employees, mainly because they seemingly posess little to no product, service, or process knowledge at all. Specifically, customers have been trained to arrive with lower expectations and anticipate the need to get over significant automated and human hurdles before being able to potentially accomplish their goals. I love passing on good customer service stories in my blog posts? Why? Because I want business decision makers to know that putting a little extra effort into customer service makes a difference and the free publicity is a nice way to reward good customer service. Writing this post was especially fun for me because it involves a passion of mine – fly fishing. Last year, I was looking for a good “backup” fly fishing rod and stumbled into a small company called Elkhorn Fly Rod and Reel out of Loveland Colorado. The Elkhorn name kept coming up in on-line fly fishing community sites so I decided to take a look at what they had to offer. Elkhorn isn’t a well-know brand like Sage or G Loomis but I decided take a chance on one of their Nomad rods and T Series reels because they looked like a good value and I like to support small local businesses when I can. My rod and reel arrived without delay and I was pleasantly surprised by the quality of both – considering the relatively low cost of the rod and reel combo. My “backup” rod looked almost as good as my $600 G Loomis rod. I also appreciated the high-quality rod holder that Elkhorn included with the rod. At this point I was already a happy customer. This isn’t a fly fishing blog so I’ll try to stay focused on the customer service story and skip the rod and reel review. A couple days after I received my order it occurred to me that I should have a cover my my shinny new reel. Covers are often included with reels so I decided to call Elkhorn to make sure I didn’t somehow miss out on a reel cover that should have been included with my order. So I called Elkhorn. To my surprise Brian Chavet, the owner of Elkhorn picked up the phone. I had read that he often did but it kind of caught me off guard. I asked him about the reel cover for my reel and he explained a very friendly way that a cover isn't included with the reel I ordered. I was fine with this answer considering the cost of the reel. Brian offered to send me a cover for the reel. At first, I hesitated, because I thought he was going charge me for the cover + shipping which I could easily get locally for less. I was completely blown away when Brian offered to send me the cover completely free of charge and shipped at his expense. At this point, Brian’s approach to customer service had already turned me into a lifetime customer and an evangelist for his products. But this isn’t the end of the story. My reel cover arrived quickly – Brian didn’t try to save a few dollars by sending the cover the least expensive way. It was a great quality cover that fit the reel perfectly. 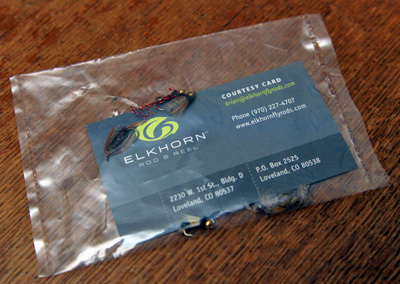 Included in the package was a “Courtesy Card” (pictured above) with Brian’s name and phone number on it and 8 fly fishing flies appropriate for the waters I fish – again, I was blown away. A fly fishing fly costs about $2 in a local fly fishing shop so you could easily call this a $15 value. The reel cover and the complimentary flies made a real impression on me – enough to form a story that was worth passing on. Brian’s commitment to exceptional customer service turned me into a lifetime Elkhorn customer. I’ll buy another rod or reel from Brian in the future. Better yet, it created a story powerful enough that I’m motivated to pass it on. A story like this sells product. Brian can compete against rod manufacturers like Sage and G Loomis by leveraging the small size of his organization to provide a personal touch – the kind of customer service larger companies have a hard time providing. Hopefully, Brian and Elkhorn can keep it up as the business grows. Great customer service makes a difference. Thanks Brian!